On Sunday December 11 I attended Mass at St. Patrick’s. 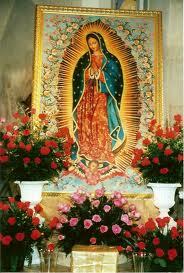 On this day a bilingual mass was held in celebration of Our Lady of Guadalupe, or “Nuestra Señora de Guadalupe”. Our Lady of Guadalupe is a very significant figure in Latin American Catholic tradition. The story goes that on December 9, 1531, Juan Diego was visited by a young women while he was on a hill in the Tepeyac Desert, near Mexico City. This woman to build a Church exactly where she was standing, but when he told the Bishop, the Bishop was not convinced and demanded proof. When Juan Diego went back, he again had a vision and the woman told him to cut roses from the bush behind him and bring them to the bishop as proof. Diego did this, put the roses in his poncho, and when he opened his poncho to show the bishop there was an image of the lady in the vision. This woman became known as Our Lady of Guadalupe, and this day in history has been celebrated and honored every year since. When I entered the Church, I sat down in the middle of the pew, but was soon forced to the other end as people crowded in by the dozens. As I was praying and quietly reflecting, a loud “BOOM boom boom BOOM boom boom” made me jump. Eight people, men and women, processed into the Church dancing and hollering, and carrying a statue of Nuestra Señora de Guadalupe. They were wearing hats that resembled sombreros only made out of brightly colored feathers, each about 2 feet long. They were dressed in blue sparkly clothing, and shook maraca-like instruments as the leader pounded on his snare drum. I had never heard this much noise in a Catholic church in my life! They sang and danced at the front of the Church before kneeling down in the aisle where they stayed for the remainder of the service. Once my attention had been grabbed, the cantor (lead singer) welcomed the congregation in both Spanish and English, then sang Ave Maria as the guitarists and bells played along. Children processed down the aisle with roses and carnations in their hands to place at the feet of the statue. They had on brightly colored dresses and scarves and outfits from their native culture. Throughout the mass, the priest spoke in both Spanish and English. He gave two homilies, and would sometimes get confused and forget to say something in both languages, which in turn confused the congregation, but overall it was a beautiful experience. So many people came to celebrate this occasion that some had to stand in the back. What surprised me the most was that I was clearly the minority, with about 75% of the congregation of Latin American heritage. But it was so inspiring to see how closely they held this faith to their hearts. We have discussed the importance of religion, specifically Catholicism, in the lives of Latin Americans, and oh, how true this is.They responded throughout the mass with excitement and sang without reservation. They were dressed as if the president was coming to Church, and even the babies had on dresses and ties. They all looked amazing! As I sat and participated in this celebration, I was moved to see how excited and joyous the children were. They sang, giggled, and actually enjoyed themselves! That is more than I can say of my childhood experience growing up in a Catholic Church. This mass was a beautiful experience, and I was moved by the joy and interest expressed by the congregation. One question that I asked myself throughout the mass is, “Are these costumes worn every year, and is this traditionally how Latin Americans celebrate the day of Nuestra Señora de Guadalupe? When I went home and did research online, I found that yes, there is always a procession of the statue, children always bear flowers, and there is percussion and dancing involved as well as bright, unique costumes. What a learning experience this was, and I plan on attending the celebration again next year!